Ally the nelephant: a french artsit called Annette Messager. 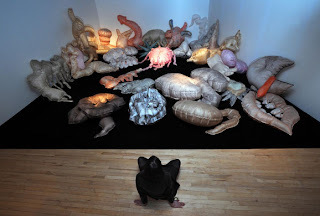 a french artsit called Annette Messager. I went to the harward today, to see Annette Messager. I was really looking forward to it. It was £11, which at first i did get a little bit angry. I sat for a good hour on the bench just staring at one of her pieces, half a room (down stairs)of soft toys doing all sorts of things. But really amazing characters.Il tell you one. Inflated animals, Huge. The fan would go on and the fan would go Off. When the fan was on, the animals would come to life for a split second (Or what it seemed like) When the fan was off, the animals would go back down. Fan on, animals would come to life. Lilac, peach, powder green.